Every parent wants the best for their child, and teeth are no exception. Here are some reasons why you should only trust your child’s smile to an orthodontist. Orthodontists are specially trained and experienced in teeth and jaw alignment. 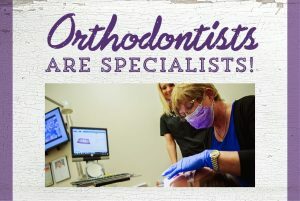 Unlike a general dentist, an orthodontist takes two to three additional years of training in the diagnosis, prevention, and treatment planning of bad bites. So not only do they understand dental health, but they’re also trained how to best alter your child’s unique facial structure. Each day, they focus on orthodontics and dentofacial orthopedics. Just like a pediatrician can provide specialized care for your child’s health, an orthodontist can provide specialized care for tooth alignment. When you take your child to an orthodontist, you’re taking them to the most experienced professionals in the field. Our orthodontists are Board Certified. In addition to being specialists in tooth alignment, Dr. Birth and Dr. Fletcher are also Board Certified, which means that they have completed rigorous studying for the American Board of Orthodontics exams. They were both required to complete a written exam, present patient cases, and complete an oral exam. To continue their Board Certification, they must take recertification exams periodically. This means that they are always up to date on the latest orthodontic practices. If you think your child needs braces or Invisalign®, put your trust in an orthodontist. Contact us today for a complimentary consultation!